Whether you are crocheting a doily, afghan or intricate shawl, selecting the crochet hook in the style and size needed is vital to your project's success. Knowing the various sizes of crochet hooks helps you choose the right hook and yarn or thread for your pattern. If you crochet loosely, choose a hook that is one size smaller. If your stitches are tight, move up one hook size. The numbers and letters on crochet hooks refer to the hook's size. As lettered hooks progress up the alphabet, the larger your stitch will be. Numbered hooks, on the other hand, produce smaller stitches as the numbers increase. The standard lettered hooks range from B through S. When you look at the letter on the hook, note that the millimeter size of the needle is next to the letter. These metric numbers are not the same thing as numbered crochet hooks, but tell you the diameter of the needle. Numbered steel crochet hooks begin with 00 and as the numbers increase up to 16 as the needle gets smaller. Use steel numbered hooks to create intricate projects with thread. The millimeter sizes of the numbered and lettered hooks overlap one another. So, if your pattern calls for a size 1-thread hook, you can substitute a letter C hook because they are both 1.75 millimeters. 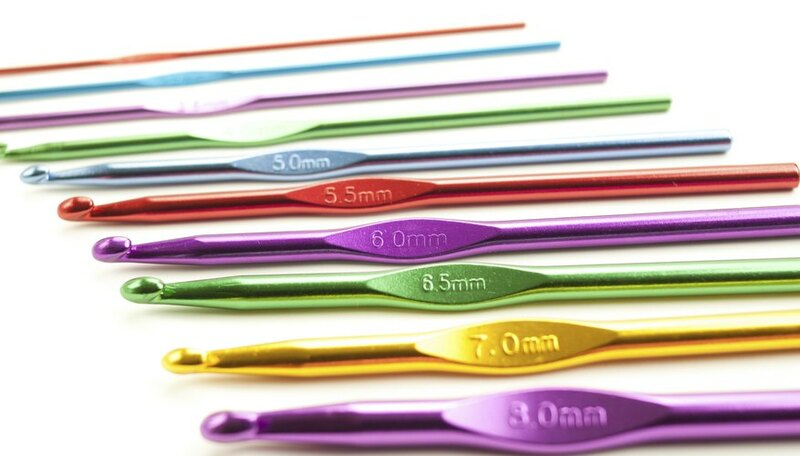 Check the millimeter size for your crochet hook to find the correct size for the pattern due to the differences between hooks used in the U.S., United Kingdom and Canada. Most hook charts compare USA and UK hook sizes, so you may want to check your pattern and chart to the hook you need. Steel -- These thread hooks are used for delicate patterns created with crochet thread. Plastic -- Not only do plastic hooks come in standard sizes, but also in very large sizes, such as 15.75 millimeters. These jumbo crochet hooks are used with bulky yarns for large projects that whip up quickly like Afghans and rugs. Aluminum -- As another common type of crochet hook -- available in standard sizes -- they feature a smooth surface for easily sliding loops through the hook. Bamboo -- If you prefer a light, smooth crochet hook, use a bamboo hook. The soft wood warms up in your hand and the yarn moves smoothly off the end of the hook. Double Ended -- These hooks are longer than standard crochet hooks and feature a hook on each end, also known as Tunisian or tricot needles, Afghan and cro hooks. When using these hooks, your crochet stitches remain on the hook similar to knitting. Circular -- A long, flexible cable connects two crochet hooks together to form a circular hook. The stitches remain on the circular hooks while you crochet. The fabric created with circular needles is thick and looks similar to knitting. Knook -- The unique feature of the knook crochet hook is the eyelet opening on the end of the hook. You thread the yarn through the eyelet and crochet leaving the yarn on the needle. The texture creates looks similar to a knitted stockinet stitch seen in knitted sweaters. Steel hooks are the smallest of all the crochet hooks and are the option for projects that include filet and lacy patterns, such as motifs for table runners, doilies, luncheon mats and cheval sets. The smaller the needle, the more intricate the pattern becomes. Standard hook sizes allow you to create crocheting projects using lightweight, sport, worsted and chunky yarns. Using smaller sized hooks, you can crochet socks, gloves, hats and baby blankets. If you want to crochet large projects like Afghans, rugs or sweaters, use larger crochet hooks and heavier yarn weights. Tunisian, double-ended and afghan hooks create dense fabric with a basket weave appearance. Washcloths, bedspreads, pillow covers, cowls and potholders are favored items to crochet with these hooks. Circular crochet hooks are for crocheting blankets, dresses, rugs and any large crocheting project. Knook hooks create close woven fabric for hats, mittens, baby blankets and scarves. The Craft Yarn Council explains yarn and thread weights, along with recommended gauges and hooks sizes for crocheting projects.